On Friday, January 9, 2015, a single-engine Lancair aircraft flown by Alberto Behar fatally crashed shortly after takeoff from Van Nuys Airport near Los Angeles. Behar was a 40-year-old robotics engineer and polar researcher who worked on various missions at NASA’s Jet Propulsion Laboratory while also running Arizona State University’s Extreme Environments Robotics and Instrumentation Laboratory. In the photograph that accompanies the story that appeared on the website of the Los Angeles Times that same day, two crash investigators examine the debris of the plane (Ryan, “JPL scientist killed in Van Nuys plane crash). In the bottom right foreground of the image, the lettering of the word “EXPERIMENTAL” can be made out through thick black grillwork. I came to know of Behar’s work inventing and developing sensors, cameras, and autonomous vehicles through the labyrinthine notes of a series of scientific articles dedicated to better understanding how Greenland’s ice sheet is melting (see Smith et al. ; Leigleiter et al. ; Carsey et al.). While for decades glaciologists operated on the premise that Greenland primarily shed ice mass via calving events that produced icebergs (see Rignot and Kanagaratnam; Rignot et al. ), around 2010 this paradigm shifted as sharper attention was given to the glacial lakes, streams, rivers, and moulins that account for the meltwater that leaves the ice sheet each year (see Gleason et al. ; Bennartz et al. ; Colgan et al.). Trying to monitor and project the melting of Greenland’s ice sheet has taken on increased urgency as climate change, through such mechanisms as the albedo effect and other accelerating environmental conditions, is reshaping the island’s ecological future while significantly contributing to global sea-level rise. Behar was a behind-the-scenes engineer who had to grapple with the challenges of how to render global climate data that is situated and responsive to often difficult-to-access polar field sites. His sensors, cameras, and crafts were designed to capture in-situ glaciological and hydrological data by going into the fast-moving and circuitous moulin drains and supraglacial channels that are increasingly appearing across the surface of the Greenlandic ice sheet. For instance, in one study that attempted to map the patterns and rates precipitated by an extreme 2012 melt event, Behar designed and built a small-scale drone vessel that was deployed to collect water depths and spectral reflectances, with the latter data crucial for calibrating satellite readings related to the channels’ variable depths and levels of discharge (see Gleason et al.). The vessel not only enabled field scientists to obtain accurate and timely measurements from the safe remove of shore (as the vessel was remote controllable from up to one kilometre away), it also foregrounded the specific spatial demands of the Greenlandic ice sheet when it comes to conducting climate-related field science. By gathering data across a section of southwestern Greenland comprised of a large lake (Napoli) and two shallow meltwater streams (Olsen River and Cold Creek), the vessel was able to improve satellite-based forms of remote sensing by enabling these instruments to more accurately account for the bathymetric dimensions of these fast-moving bodies of water with increasingly large depth fluctuations precipitated by rising glacial melt rates. The vessel ultimately allowed these climate scientists to correlate optical satellite imagery with the estimated depths of supraglacial bodies of water, thus facilitating the mapping of the Greenlandic ice sheet not as a static site of storage and slow change but rather as a mobile geography of “transient flux conveying meltwater to moulins” (Gleason et al. 216). Behar’s vessel was responsible for drawing out the volumetric dimensions of glaciers and tracking how meltwater circulated across its various strata. I want to give Behar this posthumous recognition as the in-situ readings and images he captured can reshape our experience of the scales of anthropogenic climactic change and the global networks of data that form their evidentiary base. While recent studies have found microscopic algae and airborne dust playing a part in accelerating the melting of the ice sheet (Kintisch, “The great Greenland meltdown”), Behar’s data-driven media of capture remind us of the mobility of water as it crosses from one phase state to another. From immobile ice to racing water, his attentive designs redefined understandings of polar in situ technologies as being responsive to the elemental scale of climate science. Bennartz, Ralf, et al. “Greenland melt extent enhanced by low-level liquid clouds.” Nature, vol. 496, 2013, pp. 83-86. Carsey, Frank, et al. “A borehole camera system for imaging the deep interior of ice sheets.” Journal of Glaciology, vol. 48, no. 163, Dec. 2002, pp. 622-628. Colgan, William, et al. “West Greenland: Hydrologic implications.” Geophysical Research Letters, vol. 38, 2011, n.p. Gleason, Colin, et al. 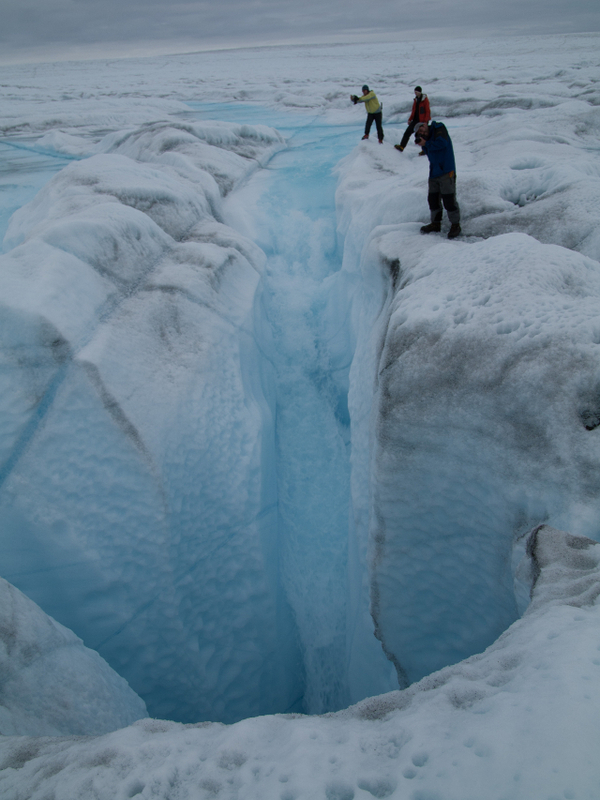 “Characterizing supraglacial meltwater channel hydraulics on the Greenland Ice Sheet from in situ observations.” Earth Surface Processes and Landforms, vol. 41, 2016, pp. 2111-2122. Kintisch, Eli. 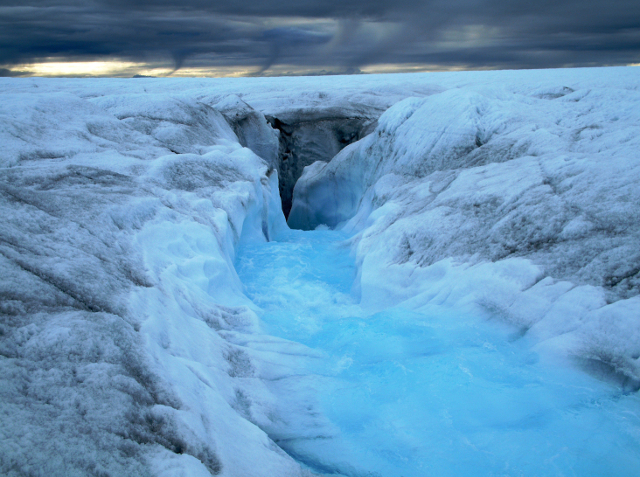 “The great Greenland meltdown.” Science (magazine). February 23, 2017. http://www.sciencemag.org/news/2017/02/great-greenland-meltdown. Accessed March 30, 2017. Leigleiter, Carl, et al. “Mapping the bathymetry of supraglacial lakes and streams on the Greenland ice sheet using field measurements and high-resolution satellite images.” The Cryosphere, vol. 8, 2014, pp. 215-228. Rignot, Eric, et al. “North and northeast Greenland ice discharge from satellite radar interferometry.” Science, vol. 276, no. 5314, 1997, pp. 934-937. Rignot, Eric, and Pradeep Kanagaratnam. 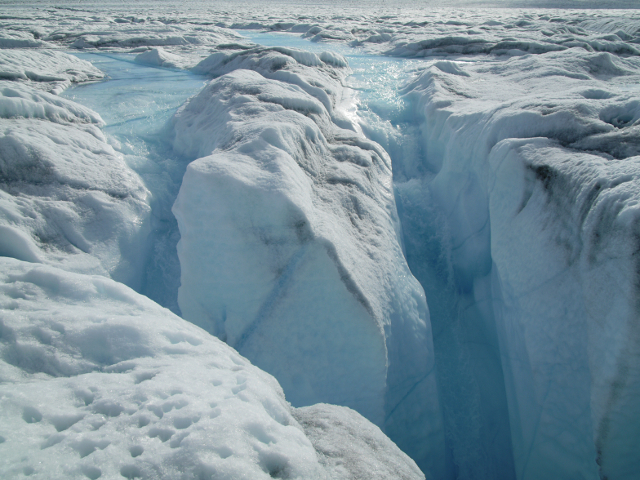 “Changes in the velocity structure of the Greenland Ice Sheet.” Science, vol. 311, no. 5763, 2006, pp. 986-990. Ryan, Harriet. “JPL scientist killed in Van Nuys plane crash aided ‘extreme’ exploration.” Los Angeles Times. January, 10, 2015. http://touch.latimes.com/#section/-1/article/p2p-82509260/. Accessed March 30, 2017). Smith, Laurence et al. 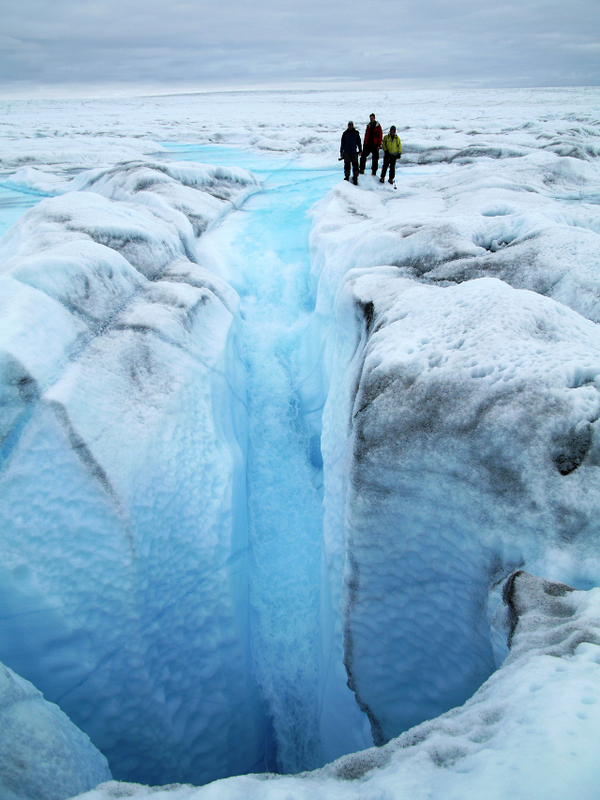 “Efficient meltwater drainage through supraglacial streams and rivers on the southwest Greenlandic ice sheet.” Proceedings of the National Academy of Science, vol. 112, no. 4, 2015, pp. 1001-1006.